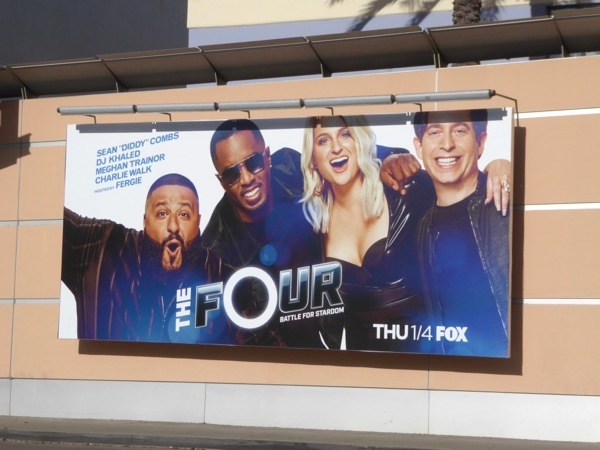 American Idol, The Voice, The X Factor, America's Got Talent and more performing contests besides, do we really need another singing competition on television? 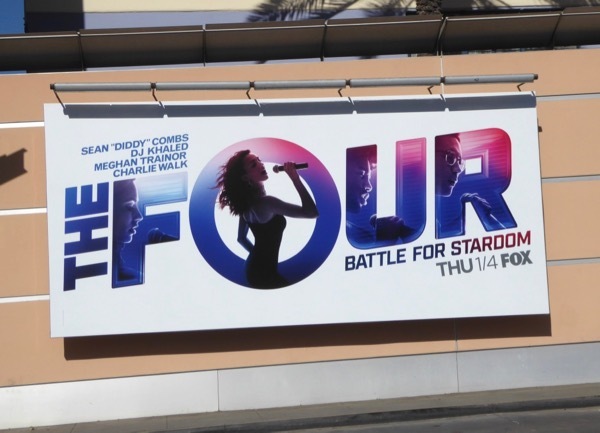 Apparently so, or at least that's what Fox believes as it debuts the Four: Battle for Stardom in the New Year. 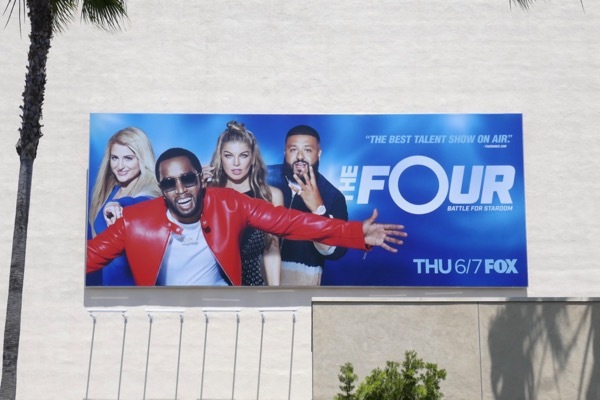 Each week four talented vocalists will sing against newcomers to defend their seats and get one step closer to their dreams of superstardom. 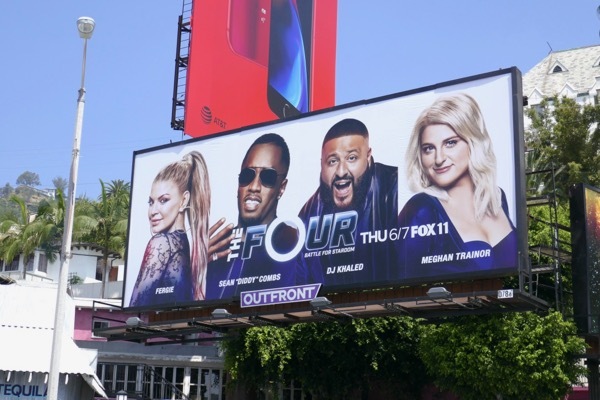 The contestants will be helped along the way by a panel of judges comprised of Sean "Diddy" Combs, DJ Khaled, Meghan Trainor and record label executive Charlie Walk, and the singing competition will be hosted by Fergie. 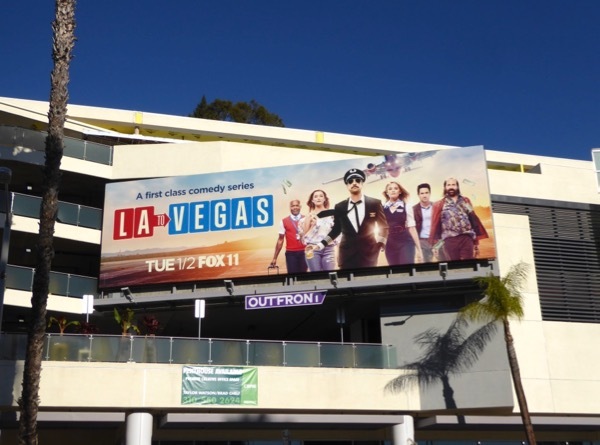 These series launch billboards were snapped at Fox Studios along Pico Boulevard, Melrose Avenue and La Brea Avenue from December 1 to December 12, 2017. 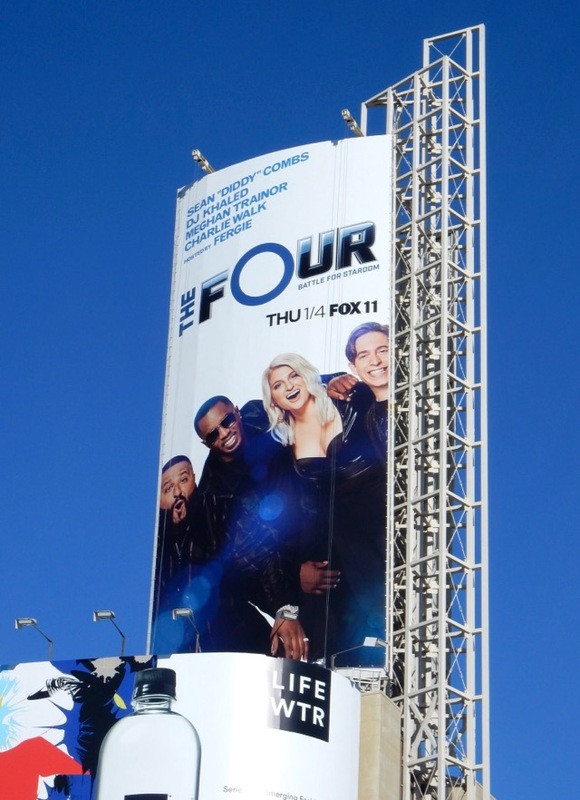 The judges version were spotted at Fox Studios on December 17, 2017, plus high above Hollywood & Highland the next day. 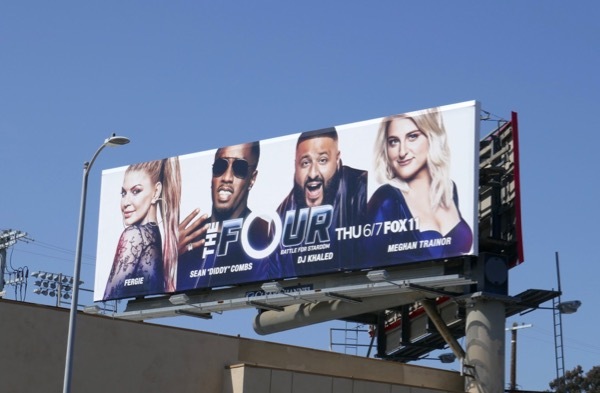 Be sure to compare these ads to these American Idol billboards, these billboards for The Voice, these billboards for The X Factor and even these Opening Act billboards. 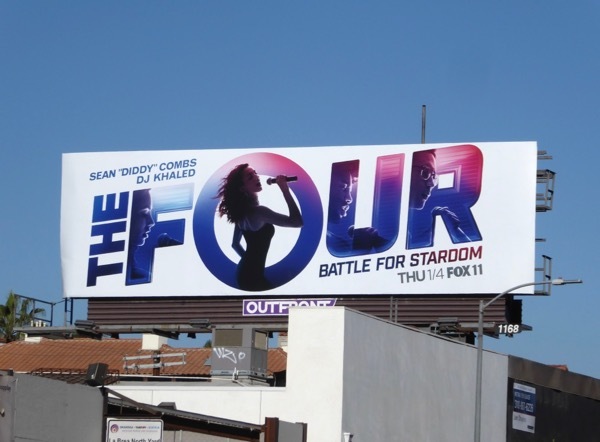 Only time will tell whether the focus will be on The Four singers in this Battle for Stardom and not the drama of the judges involved, and if a breakthrough singing sensation, or more, will truly emerge from this new show. 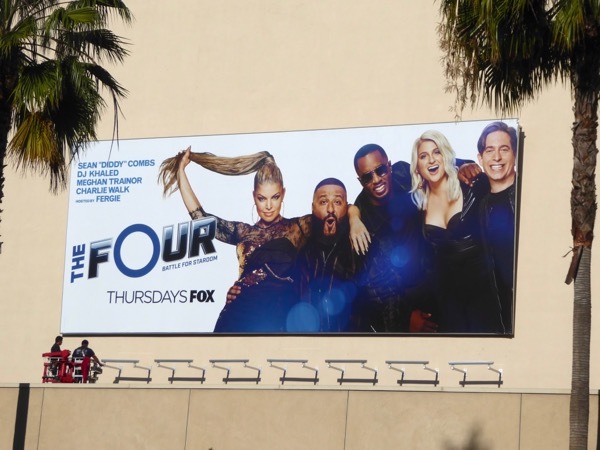 UPDATED: Here's also a newly installed billboard version featuring the show's host Fergie, spotted at Fox Studios along Pico Boulevard on January 15, 2018. 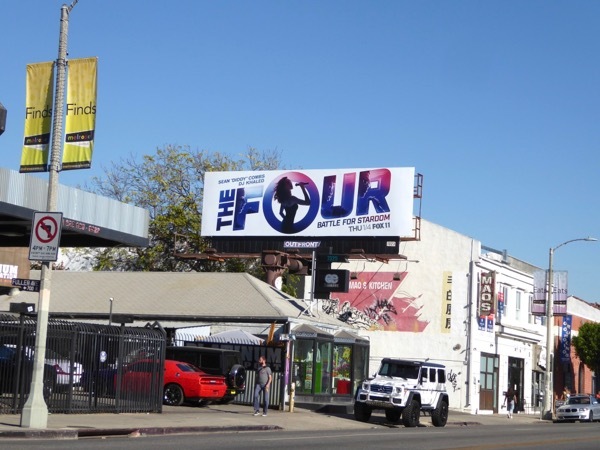 And here's another billboard featuring the four judges snapped along the Sunset Strip on January 22, 2018. 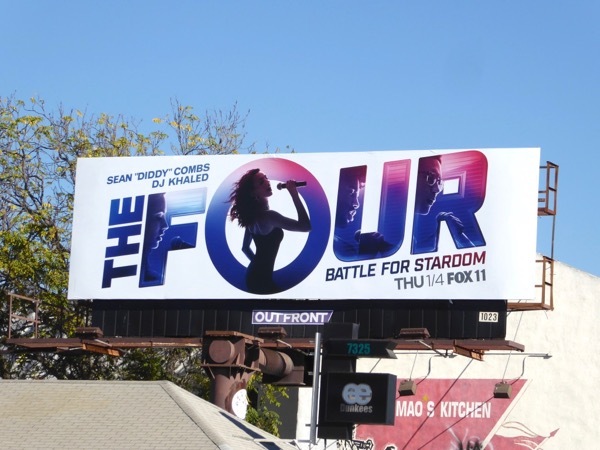 UPDATED: The Four: Battle for Stardom is back for a sophomore season already, although judge Charlie Walk won't be returning due to allegations of past sexual harassment. 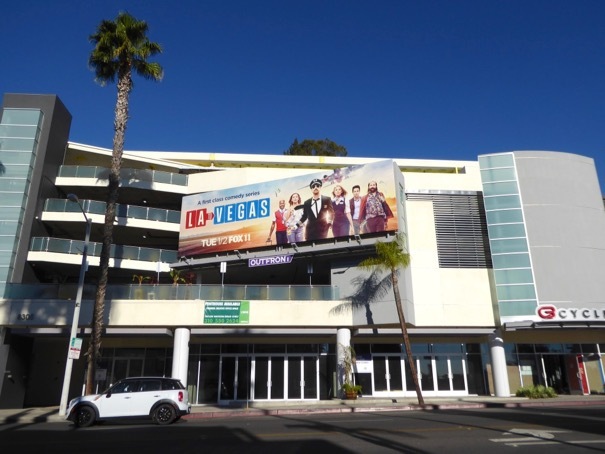 These season two billboards were spotted along the Sunset Strip and Santa Monica Boulevard on May 28, 2018. 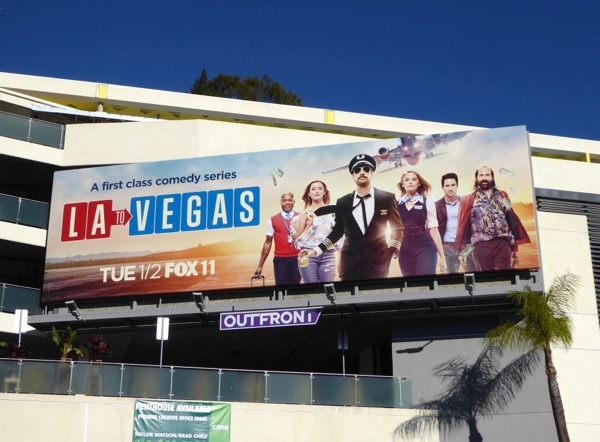 Plus here's a more colourful sophomore season billboard spied at Fox Studios along Pico Boulevard on June 1, 2018. 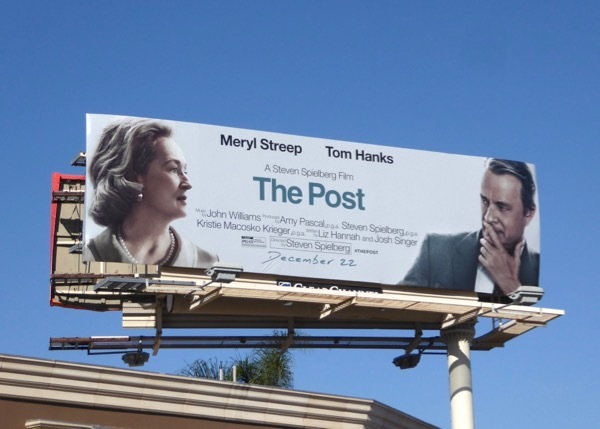 There's not enough time in the world to watch all the new movies being released this holiday season, but one film you should make time for is The Post, directed by Steven Spielberg and starring Meryl Streep and Tom Hanks. 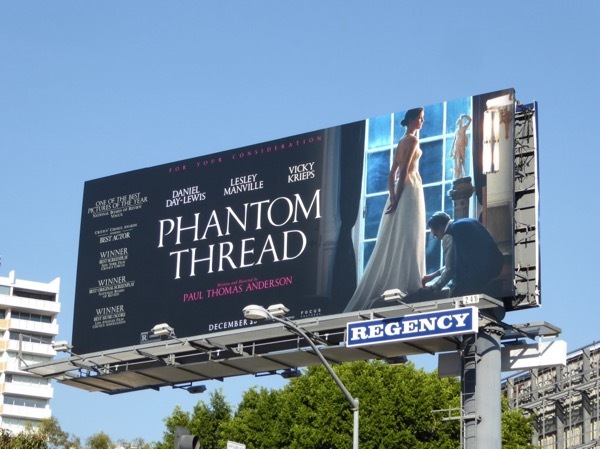 The timely motion picture tells the story of the news organisation that took on President Nixon's White House when it was discovered that the U.S. government had been lying to the American people about the Vietnam War. 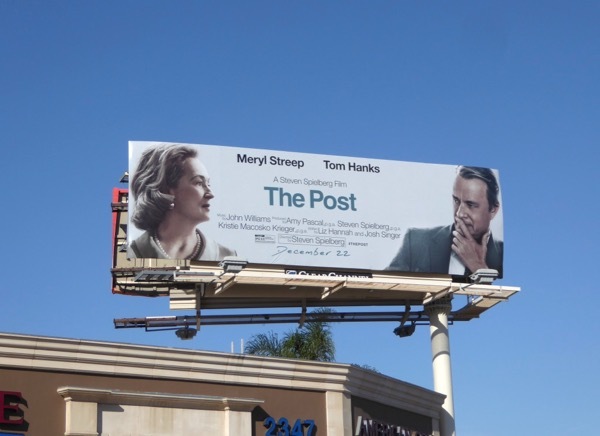 Tom Hanks plays The Washington Post's executive editor 'Ben Bradlee', whilst Meryl Streep plays 'Kay Graham', America's first female publisher risking her family's newspaper business to publish the Pentagon Papers. 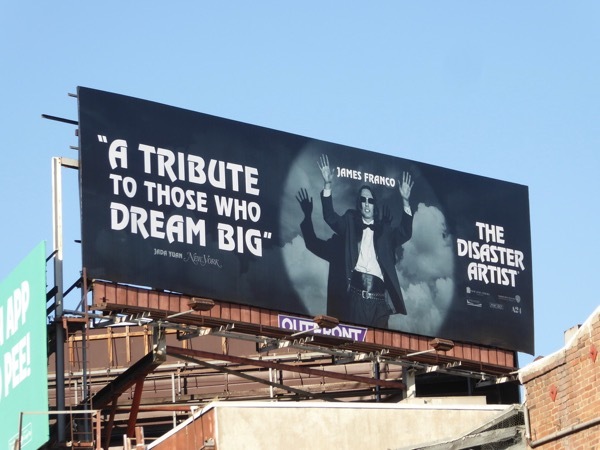 The landscape billboard for the historical drama was spotted along Pico Boulevard in West L.A. on December 17, whilst the portrait Golden Globes nominations version was snapped along the Sunset Strip on December 28, 2017. 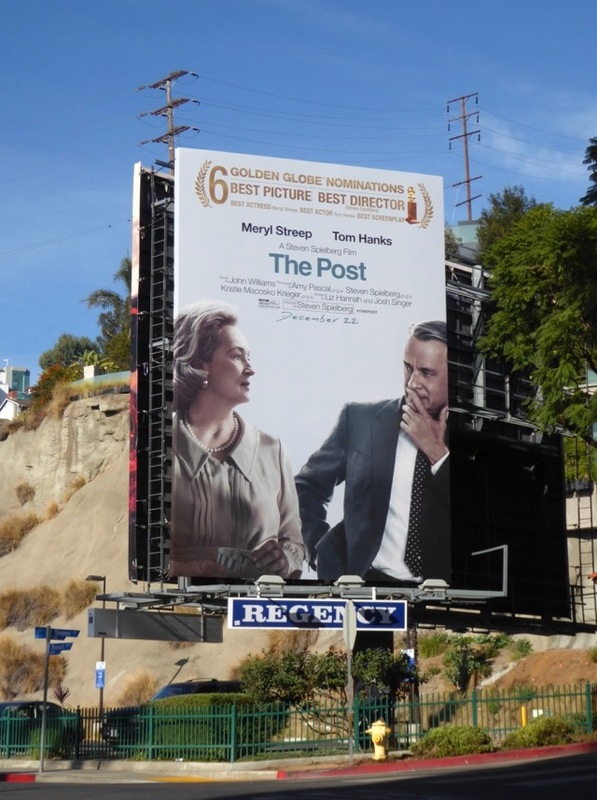 Fans of the movie can also check out Tom Hanks and Meryl Streep's costumes from The Post on display. 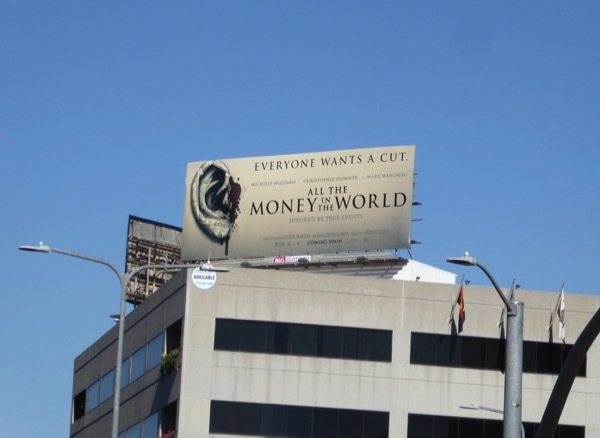 A free press, groundbreaking journalism and the media is necessary, essential even, to expose the truths that the government, corporations and those with something to hide don't want you to hear. 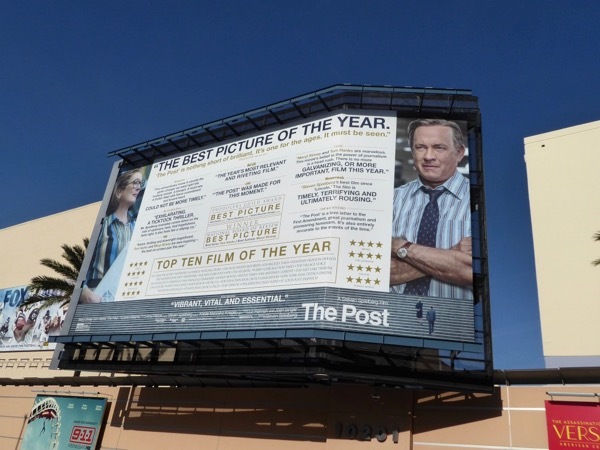 For another movie about the press exposing the truth, make sure you take a look at these Spotlight film billboards, about the Boston Globe who exposed the Catholic Church's child abuse cover-up. 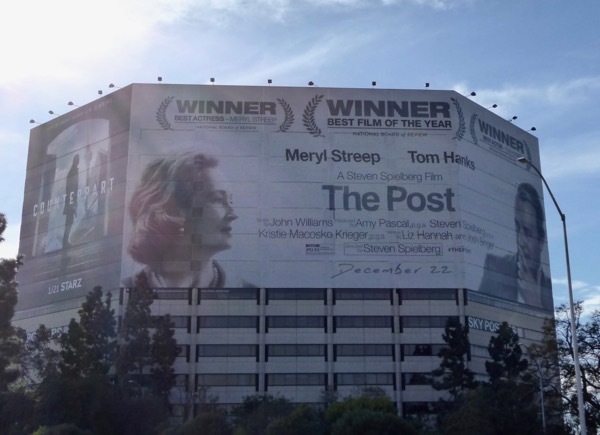 With six Golden Globe nominations, including Best Motion Picture, Best Director and Best Actress and Actor performances, The Post is already doing well this awards season, so let's see how many accolades it can win in the coming weeks. 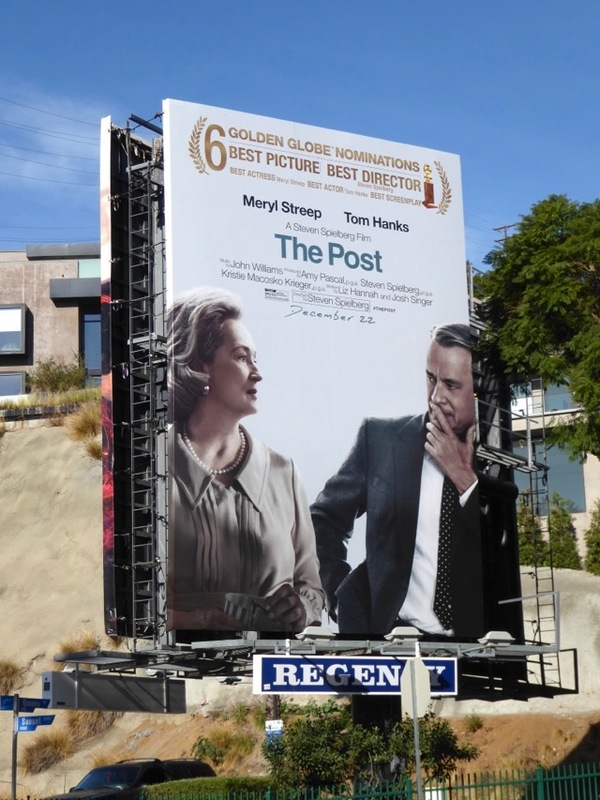 UPDATED: The Post may not have picked up any its six Golden Globe nominations, but there's still plenty of accolades to win this Hollywood awards season. 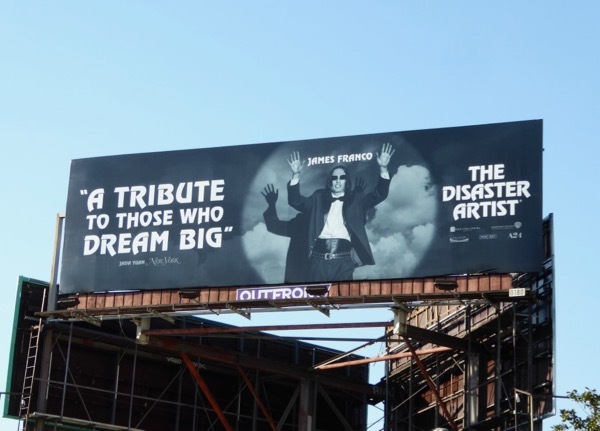 Here's also a giant billboard for the movie spotted along the 405 freeway on January 14, 2018, plus a Best Picture awards consideration billboard snapped at Fox Studios along Pico Boulevard the next day. 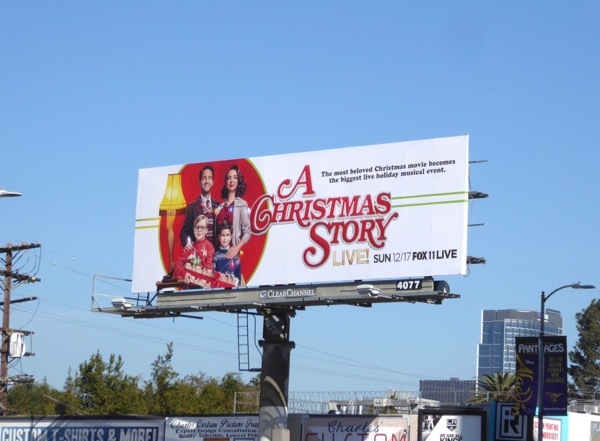 This Christmas there's an embarrassment of riches to be seen on the big screen from kidnap thrillers, rebooted family franchises, showstopping musical spectaculars and even high fashion dramas. 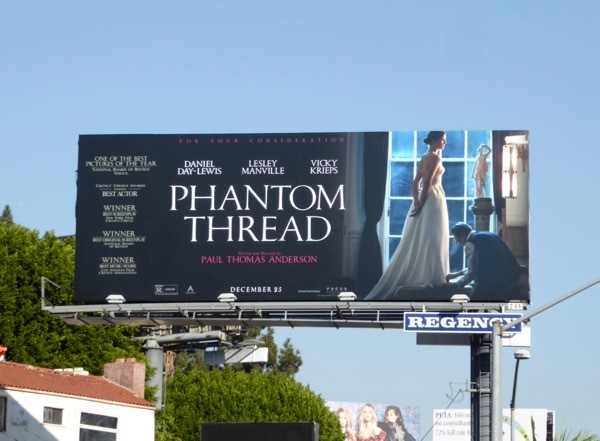 Paul Thomas Anderson's Phantom Thread is reportedly the last movie acting role for Daniel Day-Lewis and tells the tale of 'Reynolds Woodcock', a renowned dressmaker in 1950s London, who with his sister 'Cyril' (Lesley Manville) run The House of Woodcock, glamorous couturiers to high society, the royal family and film stars. 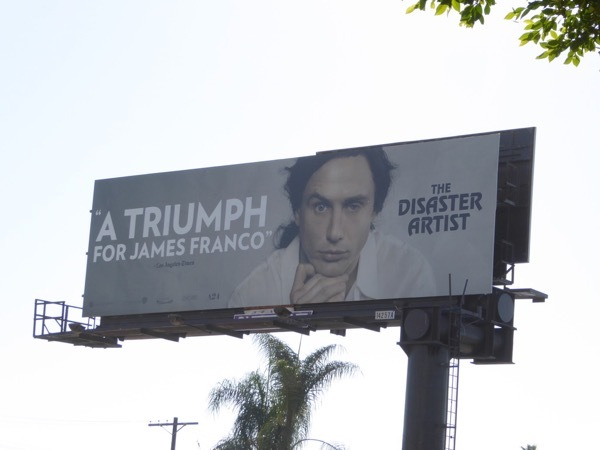 His fastidious life becomes disrupted when he falls for the young, strong-willed 'Alma' (Vicky Krieps), who becomes his muse and lover. 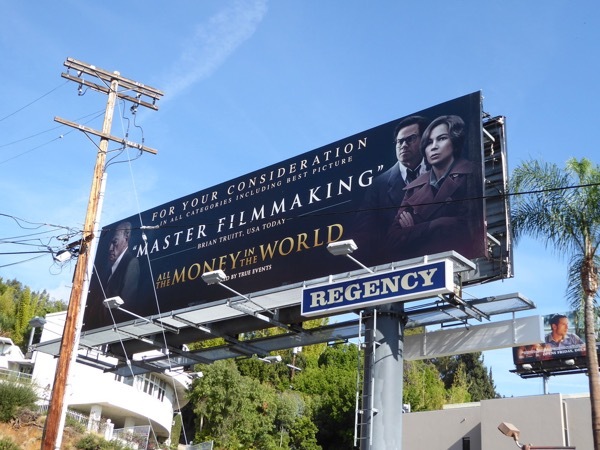 These theatrical release billboards, which also double as awards consideration ads, were snapped along Sunset Boulevard on December 19, 2017. 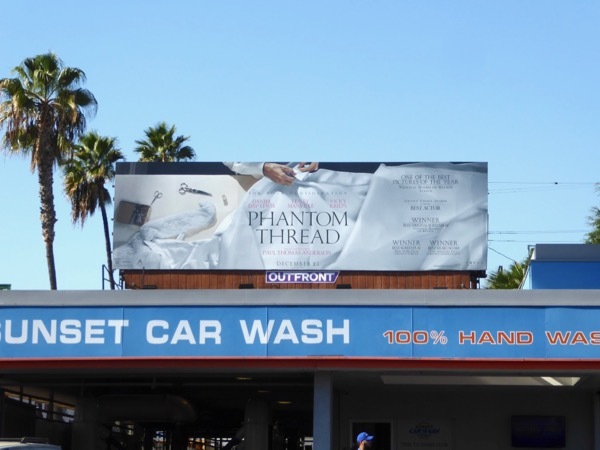 Fans of the motion picture can also check out these original Phantom Thread movie costumes on display. 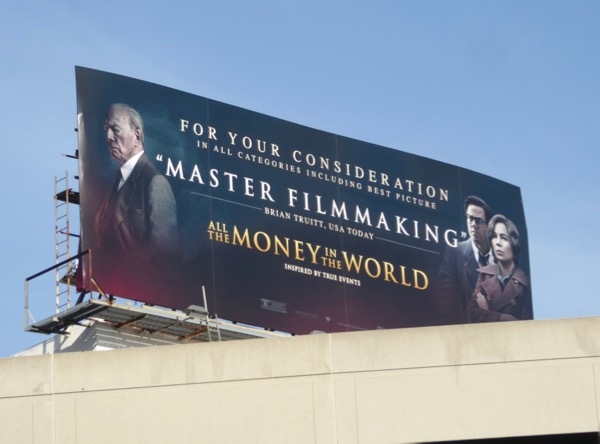 Already nominated for two Golden Globes, including one for Best Original Score and Best Actor, let's see if the movie's stars and filmmakers will be putting on their best frocks and tuxedos to collect some accolades this awards season. 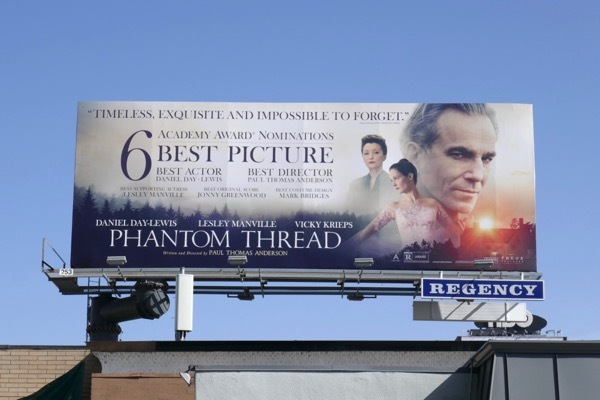 UPDATED: Congratulations to Phantom Thread for receiving a whopping six Academy Award nominations, including nods for Best Picture, Best Director, Best Original Music Score, Best Costume Design and Best Actor for Daniel Day-Lewis and Best Supporting Actress for Lesley Manville. 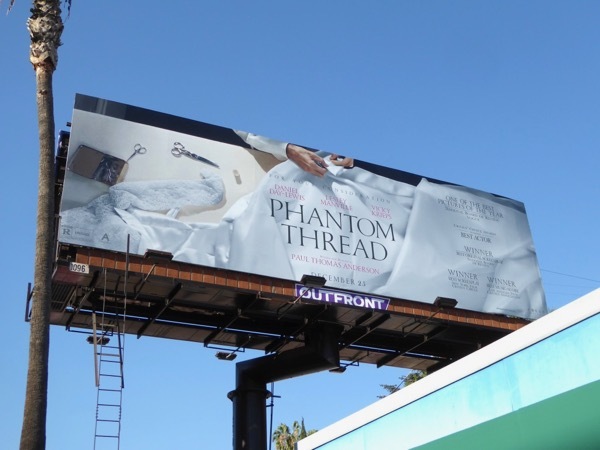 This Oscar nominee campaign billboard was snapped along the Sunset Strip on February 11, 2018. 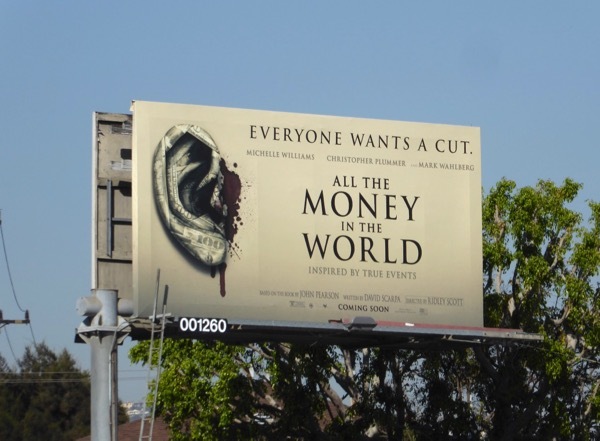 A new movie you say about All the Money in the World? 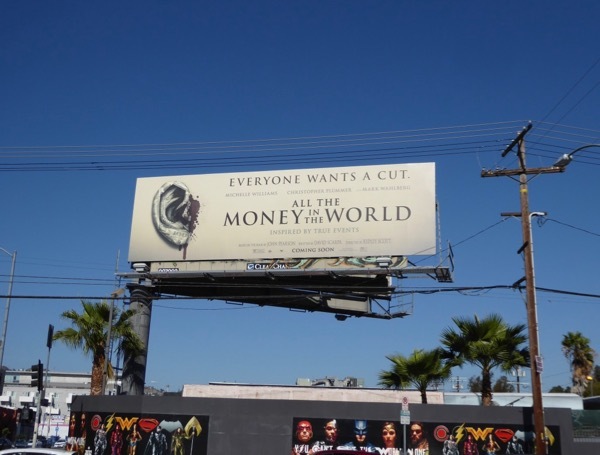 Daily Billboard is all ears. 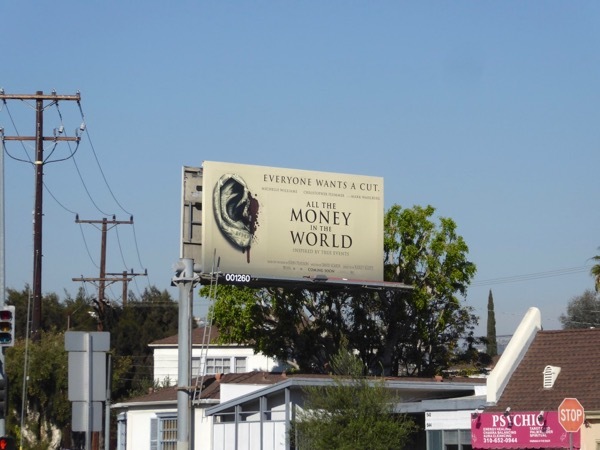 And just how much money is that, and is it ever enough (just look at the latest tax giveaway to the richest people in America by the GOP)? 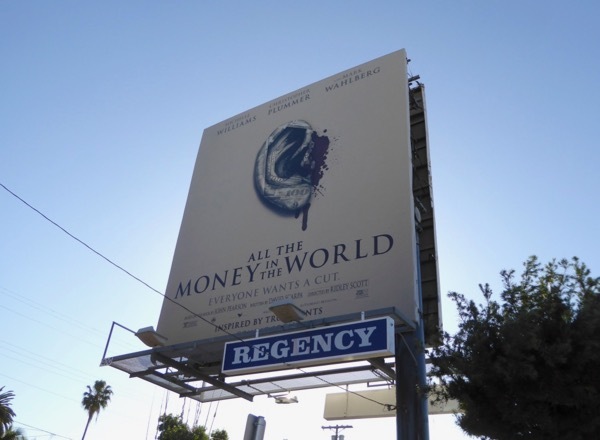 Director Ridley Scott's new crime thriller is based on John Pearson's 1995 book, Painfully Rich: The Outrageous Fortunes and Misfortunes of the heirs of J. Paul Getty, about the real-life kidnapping of John Paul Getty III on July 10, 1973. 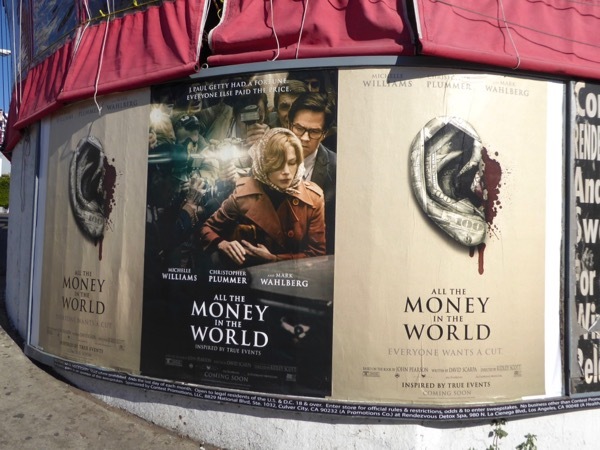 The story follows the abduction of the 16-year-old grandson (played by Charlie Plummer) of the oil tycoon and one-time richest man in the world and his devoted mother (Michelle Williams) who attempts to convince his grandfather (Christopher Plummer) to pay the ransom, but he believes if he does his other fourteen grandchildren will become kidnapping targets. 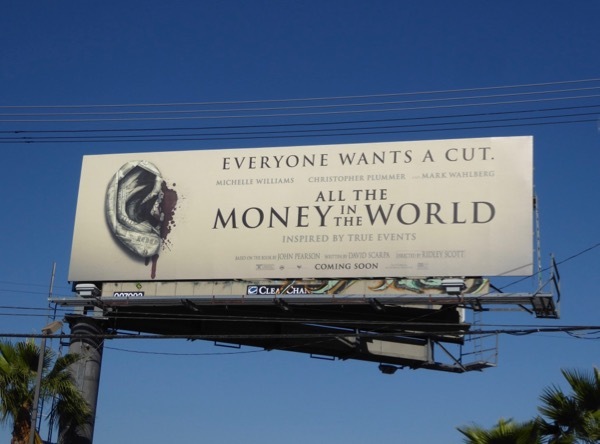 After refusing to pay, his mother desperately teams up with Getty's business manager and a former CIA operative (Mark Wahlberg) to help free her son. 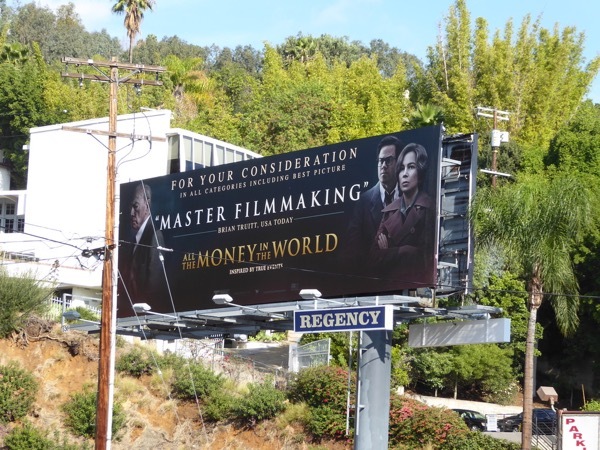 All the Money in the World isn't just scandalous because of Getty's refusal to pay, but also because of the current sexual harassment scandal surrounding Kevin Spacey who originally played the billionaire which led to the role being recast and re-filmed by Christopher Plummer, earning the actor a Golden Globe nomination. 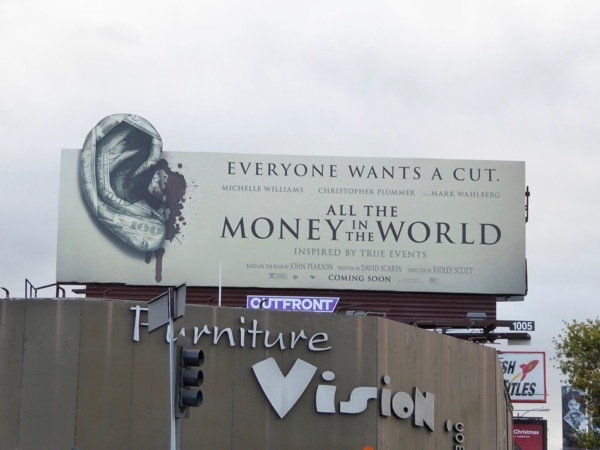 A severed, bloody ear (the cost of not paying the ransom) has never looked so eye-catching and certainly stands out in the crowded city skyline. 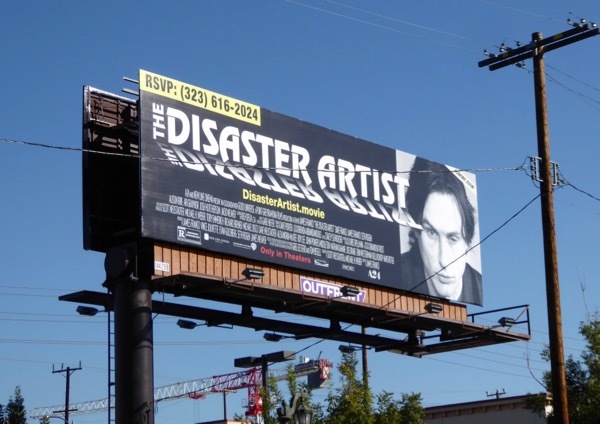 These movie billboards and street posters were spotted along La Brea Avenue, San Vicente Boulevard, Fairfax Avenue and La Cienega Boulevard from December 1 to December 14, 2017. 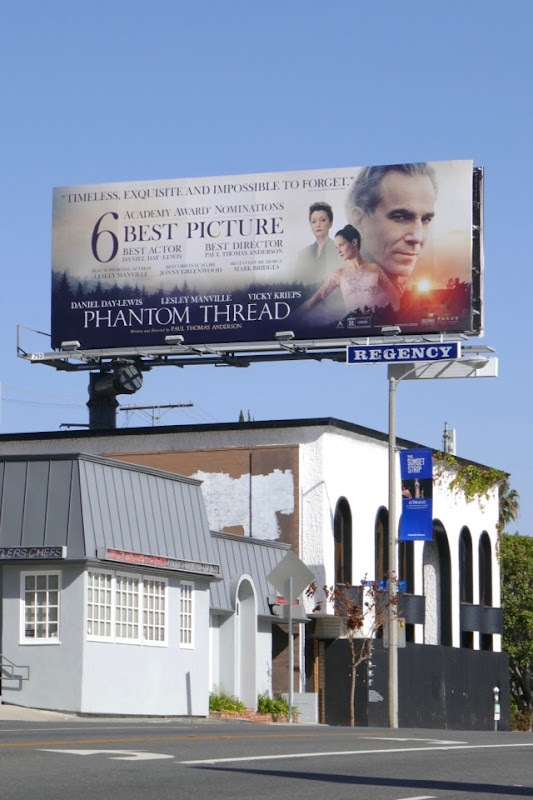 With the feature film up for Best Actor, Best Actress for Michelle Williams and Best Director, can this biopic take home all the statuettes this awards season. 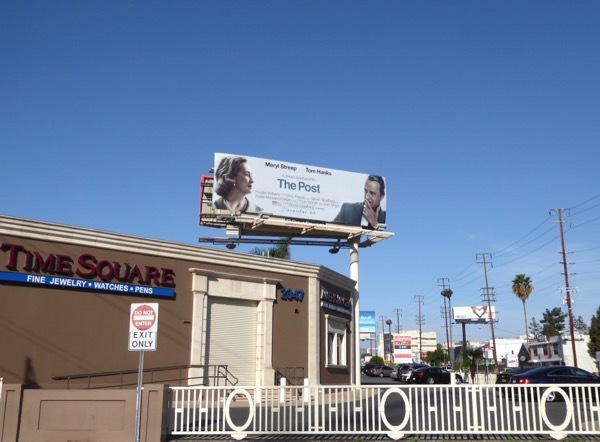 Happy Boxing Day and enjoy the movie if you're off to the cinema to see it today. 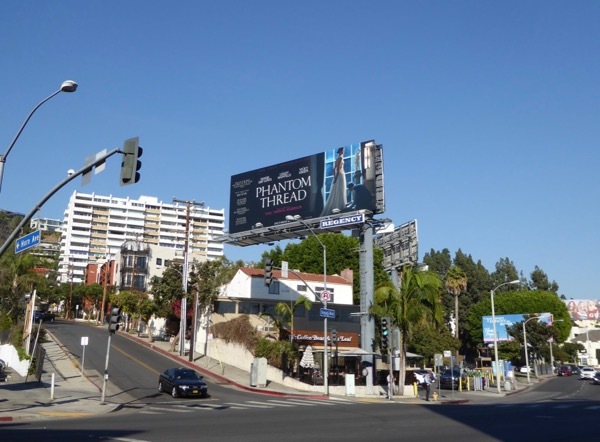 UPDATED: Here's also an Oscar awards consideration billboard for the film spied along the Sunset Strip on January 10, 2018. 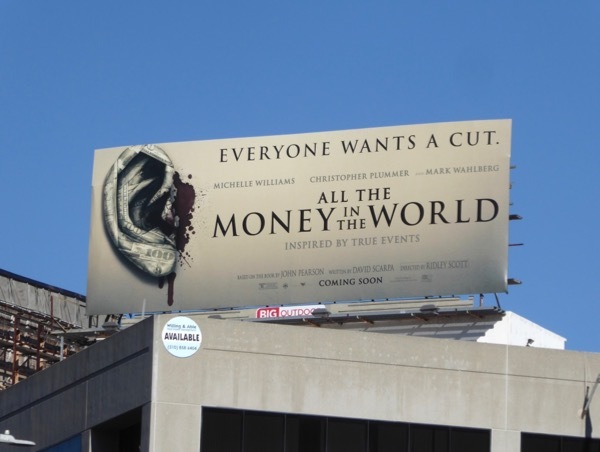 Maybe if the movie wins Michelle Williams will get equal pay for her reshooting work on par with Mark Wahlberg. 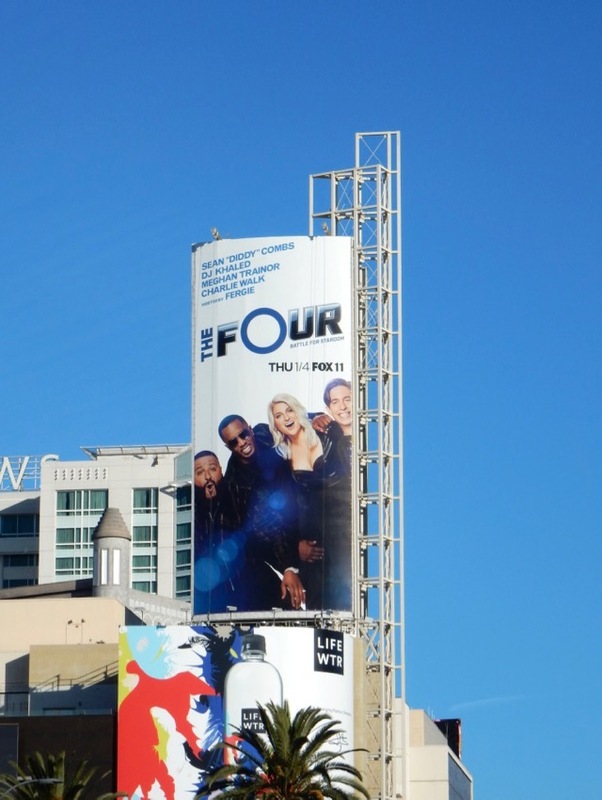 Plus here's another FYC ad example spied high over San Vicente Boulevard on January 12, 2018. 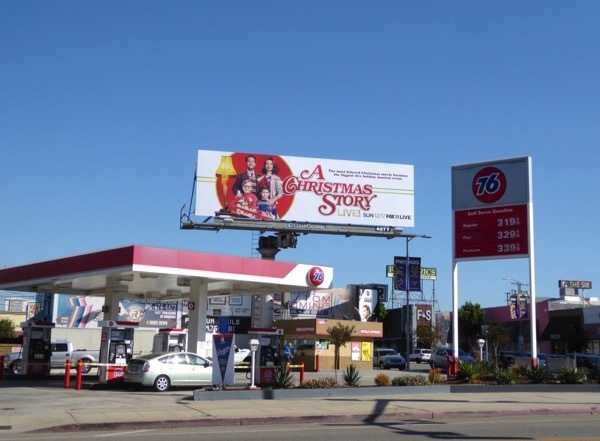 Merry Christmas to all Daily Billboard's fans, followers and friends this festive season. 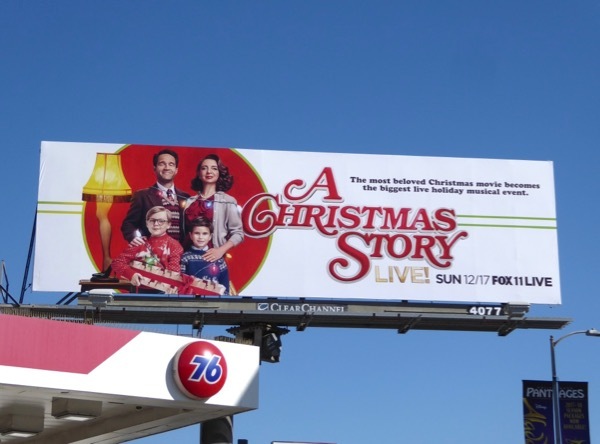 Even though A Christmas Story Live! 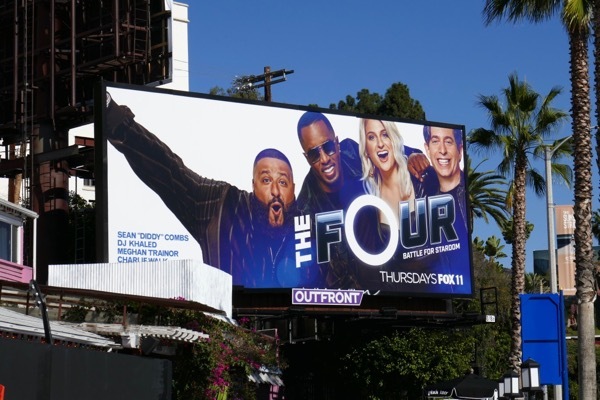 aired over a week ago Daily Billboard couldn't resist saving these billboards for the musical television event for this special day, for obvious reasons. 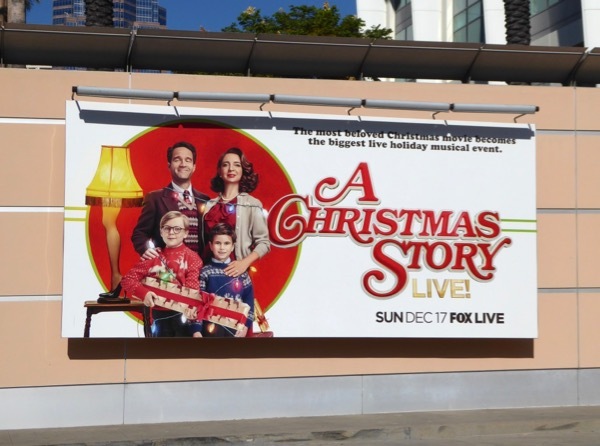 The TV special incorporated the classic 1983 movie and the 2012 stage musical and stars Maya Rudolph as 'Mother Parker' and Chris Diamantopoulos as 'Old Man Parker', with Andy Walken the young nine-year-old 'Ralphie Parker' and Matthew Broderick narrating as the adult Ralphie. 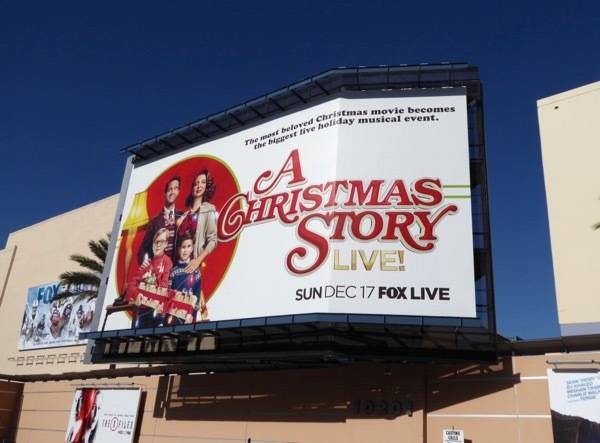 Set in 1940s Indiana, the festive musical event which focuses on Ralphie's desire for a Red Ryder BB gun for Christmas also stars Jane Krakowski, Fred Armisen, Ken Jeong and an opening number performed by Bebe Rexha. 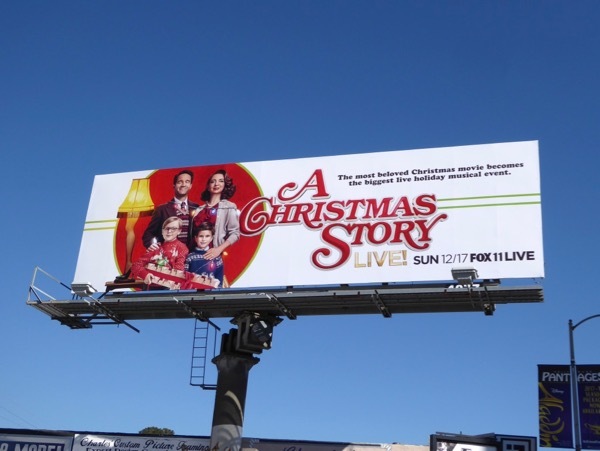 These billboards were first photographed along Pico Boulevard on December 1, with the giant-sized version spotted at Fox Studios Lot on December 17, 2017. 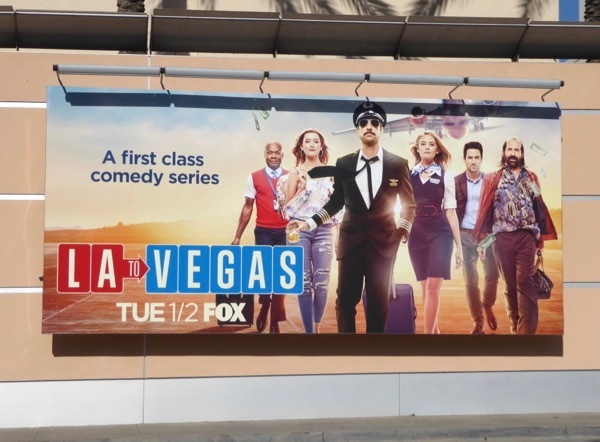 Meanwhile fans of Maya Rudolph can also enjoy these Up All Night TV billboards and these Bridesmaids movie billboards. 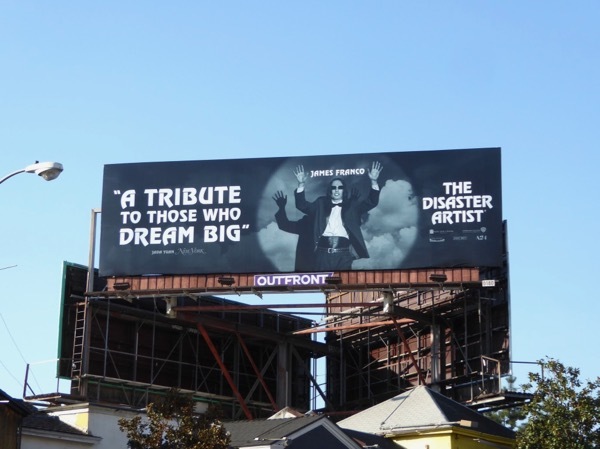 However you celebrate today and whatever Santa may have left you under the Christmas tree, have a wonderful time and eat, drink and be very merry.